Call it the Safal model. For close to 25 years, a large chunk of households in the National Capital Region have had access to fresh fruits and vegetables at affordable prices—at rates much lower than what the local vegetable and fruits market or the handcart vendor would charge. This was made possible by standing the concept of buying on its head. Instead of the farmer coming all the way to markets where the middleman would fleece him and where he had to pay steep taxes, the market went to his doorstep. As a result, customers could get the fresh products daily, making the farm-to-fork concept a reality long before retail chains began doing so in the metros. It is the Safal model that these chains also employ. The inspiration was milk. A decade and more after Mother Dairy, a fully owned subsidiary of the National Dairy Development Board (NDDB), had established itself as a leading vendor of milk purchased mostly through cooperatives of farmers, it turned its attention to fresh produce and edible oils. As a state-owned undertaking, NDDB’s basic mandate in all such endeavours is to provide a market for farmers through the cooperative framework and to help them get the right price for their produce. It cannot at the same time afford losses, says Pradipta Sahoo, horticulture business head at Mother Dairy Fruit & Vegetable Pvt Ltd (MDFV), which owns the Safal brand. In the case of edible oils, sold under the Dhara brand, there is the larger issue of reducing dependence on imports. Sales, though, are just over Rs 350 crore in a market that is valued at Rs 75,000 crore— and this 22 years after it launched its first branded cooking oil. Safal, on the other hand, has fared much better. Turnover is now Rs 550 crore and has been growing steadily at around 10 per cent annually, with the brand becoming a household name in NCR . 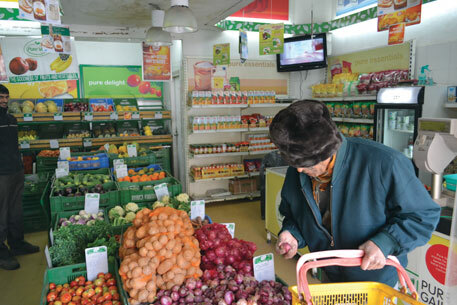 Its 400-plus outlets provide vegetables that are 5-15 per cent cheaper than the market rate, apart from bigger discounts on items that are in oversupply. This has helped to build up consumer loyalty for MDFV, which sells about 350 tonnes of fruits and vegetables daily. Its strong point, however, is the backend of its operations, which in this case means the farmer. It works at the village level through its area stations which have agriculture graduates on call for farmers. Over time as trust developed, Mother Dairy has been able to put together over 200 farmers associations with a membership of 8,000 farmers straddling 14 states. But the relationship is sometimes rocky. Since there is no written contract, farmers are not bound to sell their crop to MDFV. Quite often loyalty was at a discount when the big names in domestic retail, such as Reliance Fresh, Spencer’s and More made their debut in Delhi five to six years ago. With their deep pockets they were able to buy out stocks of popular vegetables from farmers at higher rates while still keeping the prices low for consumers. Farmers are still switching sides. Old-time associates of MDFV, however, say they would prefer to stay with Safal as long as the price is reasonable. 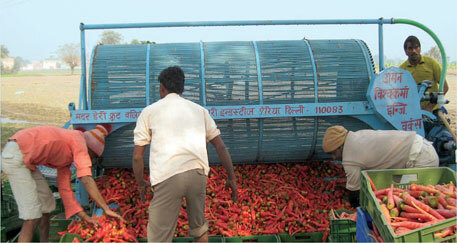 Vinod Jhajharia from Abohar in Punjab has been selling vegetables to MDFV for the past decade. “I started by supplying bottle gourd to the company and then switched to kinnow (a hybrid citrus fruit) because the profits were higher. Company officials have helped me improve quality and given me an assured market,” he told Down To Earth. The compelling reason for Jhajharia, as for other farmers, is that he gets the Azadpur rate without the aggravation of going to the mandi, haggling with the adhtiyas or commission agents and paying fees, taxes and bribes. “That can be a painful and time-consuming affair,” he says. There are other horror stories. Jhajharia says he once fell prey to an adhtiya who took away his produce worth Rs 80,000 and never paid him. The other reason is assured payment, adds Surinder Juneja who heads the Abohar Safal Farmers Association. 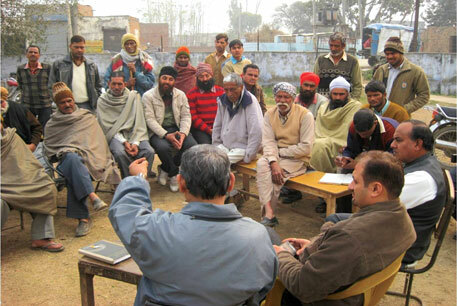 The association, formed five years ago, covers farmers of around 150 villages. Their average farm size is two to three hectares. Most of them grow kinnow for which Abohar is famous. They also supply carrots and radish to MDFV. “A farmer has a harrowing time when he goes to the mandi. In Punjab we have to pay 4 per cent market fee, and 5.5 per cent VAT apart from commissions to the adhtiya. We save ourselves all this bother and make a profit even after Safal cuts transport cost from the final price,” explains Juneja. The taxes and fees are levied under the Agriculture Produce Market Committees Act and it varies in each state. Although the Centre has been calling for its reform and has put up a model Act for states to implement, few states have done so. As a result, if a farmer from Jammu and Kashmir wants to sell his produce in Delhi, he would have to pay taxes and octroi to each of the states he passes through. For Juneja, the comfort MDFV offers is that it is a public sector company and works through the cooperative model. “We have established a good working relationship over the years,” says Juneja, “because of our faith in this model”. But he confesses that association members do sell to other buyers, including retail chains, because Safal’s operations are limited and cannot absorb all that they grow. MDFV cannot do that. But it believes “competitors cannot steal the trust Mother Dairy has built up in 25 years.” Whether it can withstand the harsh economics of the marketplace remains to be seen. I think its an excellent story catched by the DTE team. What is very important is to save the farmers from the plight of bankruptcy. They slog day night in the fields and get peanuts paid against the same. Moreover, the commission and the investement that goes along with the agriculture produce only adds to their atrocities. With the safal model, the best part is, it completely sidetracks the middle man's harrassment, which the farmers often get stuck with. So this kind of a model will not only help them work with satifactory results and yet get what they deserve. Safal has the backing of a cash rich NDDB. What is return on this investment? What is the payback period. 8000 farmers in 14 states is not a large operation. What is the percentage of f&V farmers it has covered in a radius of say 100 km around Delhi itself? A very commendable story indeed and the authors needs to be complimented. The value added in the story could have been enhanced with some deeper insights into collusive and conniving practices being followed in the fruits and vegetables marketing. This is particularly true since the launch of Horticultural mission. Besides, the back-end investment (all variants)done by the state as well as the retail chain owners could be highlighted to show how the budgetary bias for such neccessities have faired at the grass roots. I agree with prof George, despite the fact that we have cooperatives like Verka and Vita in Punjab and Haryana, they are just a success name in dairy only. But Mother dairy has ventured out from its mandate and has become a success story. If we talk about masses, we cannot deny the fact that middle-class still prefers to buy their veggies from the road vendors or mother dairy and it's a name we all have faith in. As a consumer, I always check Safal price with local vendors, weekly market, and chain stores. I found Safal rates, particularly fruits, are higher than even local vendors and vendors at weekly market. Safal is making a good margin of profit, although not passing this profit to the farmers. Earlier we used to get lower price of vegetables than local vendors. But, nowadays Safal is government's vehicle for creating a sense of inflation to the common citizens. For example, you visit any local weekly market you will get good quality apples at Rs. 60-80 per kg. While in Safal you will get almost rotten apples at Rs. 99 per kg.